At the Old Red Museum, there’s always something new to discover. The galleries on the second floor give a tour of Dallas County history from prehistory to present day, with Early Years, Trading Center, Big “D” and World Crossroads offering exhibits featuring elements that range from fossils and war weapons to sports paraphernalia and Dallas County’s contribution to popular culture. Plus, our first floor galleries continually present new, exciting exhibits which transition several times per year. What will you discover today? People of vision found and nurtured communities on the inhospitable border. The first settlement in what is now Dallas County began in late 1841 at a crossing of the Trinity River at today’s Dealey Plaza. Pioneers moved into the area at the encouragement of the Republic of Texas and Peters Colony. By 1873, county leaders persuaded two major railroad lines to intersect at the burgeoning city. Successful exploitation of economic opportunities transforms Dallas County. The arrival of the first two railroads in 1872 and 1873 brought boom days for Dallas County, making it an important regional center for trade. 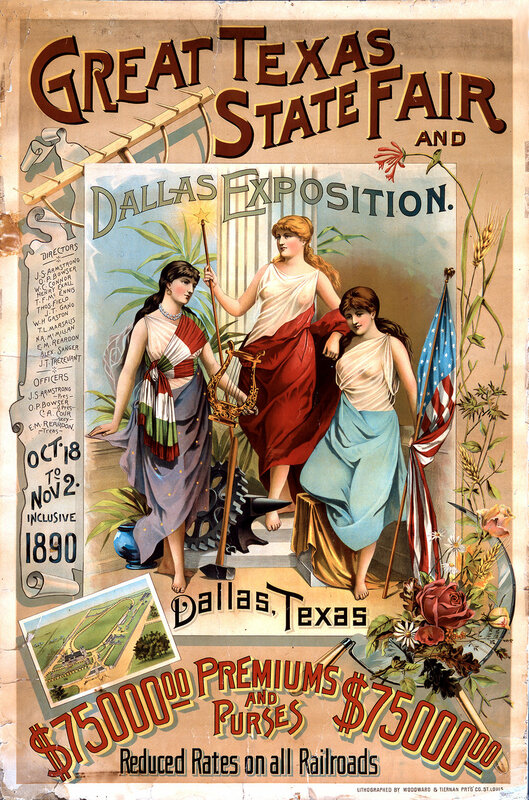 Wholesale business, aviation and the State Fair of Texas broadened Dallas County’s population. Throughout the county, towns such as Lancaster, Richardson, Irving and others became trading centers for surrounding farmers. Dallas gains national recognition and faces the challenges of a major metropolitan area. In this period between World War I and the end of World War II, Dallas matured as a major city and gained the nickname “Big D.” In 1936 the highly successful Texas Centennial Exposition brought national headlines to the city. For the first time in its brief history, Dallas County became nationally significant. Post-war Dallas identifies new directions and, following national tragedy, reinvents itself for the 21st century. In the immediate post-war era, communities saw their boundaries expand dramatically, and once-sleepy county towns became boomtowns. The Metroplex blossomed from national significance to international prominence during this period. Dallas County became noted for a television show, professional sports and its concentration of Fortune 500 corporations. The future of Dallas County begins here.